It’s Valentine’s Day this week and online casinos are all dolled up with their shiny hearts, cupid arrows and other lovey-dovey decors. Not that we have anything against Valentine’s Day, but sometimes the saccharine theme does go a little bit over the top. 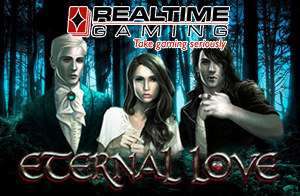 If you still want to mark the International Day of Love but move slightly away from the Hallmark-like feel of the holiday, we suggest that you head to online casinos that carry games by the software group, Realtime Gaming and seek out our favorite love-with-a-twist-themed slot game, Eternal Love. The vampire-themed Eternal Love slot can be found at RTG-powered online casinos such a Springbok Casino, Punt Casino, Yebo Casino, Silversands Casino and Thunderbolt Casino. In fact, the list of gaming sites where you can play Eternal Love is made up of some of South Africa’s most popular online casinos. If you are still sold on the ‘happily-ever-after’ ending on the greatest love stories, but don’t really buy into the sop, then Eternal Love is for you. The game is themed loosely around the famous Twilight series of books and movies but brings you so much more thanks to the bonus-rich features. This is a 5-reel slot game with 243 ways to win, which will keep you entertained for a long time. • Wild Symbols – The wild symbol in this game is the Eternal Love symbol. When it appears on the second and fourth reel, it replaces all others (except the scatter) to form winning combinations. All wins are multiplied by up to 3 x with the wild. • Scatter Symbols – Three or more scatter symbols trigger 10 free spins. • Bonus Round – A fun feature during the 10 free spins is the appearance of a Life Meter. After you have completed the free games, the meter will reveal its win value. If you don’t manage to reach the Life Force level, the Extended Life feature is activated. During his feature, you earn additional free spins until you reach the Life Force level. You are looking at wins of up to 1,000 x your triggering bet.